Another week of Doctor Who, another week reminding folks that I’m no fan of spoilers. Which means I need something for spoiler space here. Yeah, that’ll do. It’s Sci-Fi… of a sort. And now… inevitably… Bluey. Because once again I’m watching it on ABC HD, because why wouldn’t you? It’s going to feel weird when I pick up the Blu-Rays and Bluey isn’t at the front of each episode. Why yes, I do buy Blu Ray box sets of Doctor Who. Some things need to be owned, folks. Also, I’m kinda old fashioned that way. Also, need I say, poor long-suffering Dad. He suffers for the art. Although he did get a hotel room with a lady in the shower, which is probably winning in some important way. As long as the lady is Mum (which it was). Ahem. This isn’t meant to be a Bluey review. I’m failing, yet again. And yet… I still don’t care. I may or may not be headbanging to that theme tune arrangement. OK, OK, I totally am. Also, once again writing as a stream of consciousness. For whatever value of consciousness I have after a long week. “Nice Fjords”. I’d like to think that somewhere, Slartibartfast is smiling. The Doctor… should not eat soil. I mean, she’s meant to be a role model for children. Although, I guess, I’ve never tried soil. Maybe there’s something to it. Emergency Cheese & Pickle Sarnie in the coat pocket: Malcolm’s more like the Doctor than the Doctor is. Also, that soil is looking more and more appetising now. This series has REALLY loved base under attack tropes. I’m loving the music and lighting, but given that heavy reliance, it’s going to have to work hard to impress me. I so, so, SO want this to be a misunderstanding with Moomins. Yes, they’re Swedish, not Norwegian, but they could travel, couldn’t they? Great use of music and lighting in place of effects or reveals. Which is fine, of course, although I’m dreading that there will be a Raimi-esque tracking shot somewhere. That would be a bit much. Then again, if the mirror leads to Sutekh’s tomb, I forgive EVERYTHING. Splitting up always works so well in horror movies. And this is a fair bit darker than we’ve seen in our other base-under-attack stories. “Erik… the human. His daughter’s missing him” — love it! The scene with Ryan dragging Hanna around is… awkward. Well paced and acted, but it’s sending out a really creepy vibe around Ryan’s character that I don’t much like. His intentions are fine, of course, but outside that context…. not so much. Ribbons reminds me a lot of Sabalom Glitz, just to keep up with my “must make classic series references” quota. Except of course for the whole “getting eaten alive by Mothras” bit, of course. Unless things went very sour for him once Mel was on board Iceworld, that is. OK, that moment with Graham and Grace was a great one. Worked SO well. Mind you, this gives Doctor Who a LOT of different afterlives. Not sure how I feel about that one. 7 Grandmothers. Yep, that’s very Doctor Who. Poor Grannies 1-4, always trying to keep up with the spoiling that Granny 5 clearly did. I for one don’t believe her anti-Granny 2 propaganda for a second. “Reverse the polarity” — and then, Doctor Who itself does a callback and a glorious one at that. I get lots of moths outside my home. I mean… LOTS. And now I might never go outside again. Hanna’s mum is pretty evil in a dark forces kind of way. Although (minor nitpick incoming!) that’s where the plot and characters should all freak out and run at the mirror. They’d know then, no matter how much they’d want their dead spouses back. Whittaker’s “I will give you everything” speech is excellent. And so very The Doctor in a way that I feel like I’ve been waiting for all season. Nice one! The Solitract wants to be a poorly animated frog? That… I did not see coming. I do wish it had more budget right then, because while it was a nice gag in a way, it did just look cheap. I totally want to see Jodie’s destabilising animation with 3D glasses on. Of course the Solitract lets The Doctor go. It turns out it’s not easy being green. OH MY GOD I’M IN SHOCK WE GOT THE WHOLE FREAKING CREDITS AND THE TEASER WITH NO ROVE INTERRUPTION! BEST DAY EVER!!!!!!!!!!!!!!!! Ahem. I said that out loud, didn’t I? Well, that didn’t resolve in the way that I thought it would, but it was all the better for it, I think. Not the best of the season, but quite enjoyable and one that I’ll enjoy watching again. Although the cheap frog at the end does bring it down a notch or two. Next time: IT’S FINALE TIME, PEOPLE! Also, the Battle of Ranskoor Av Kolos. Whatever one of those is. Just buy a set of bluey with the doctor set, problem solved. Now why didn’t I think of that? You sound like a bright intelligent young woman — must have excellent parents. I rate this one somewhat higher, really enjoyed the multiple twists. Also Ribbons totally looks like Doomlord. How did I not spot that? Doomlord, playing Ribbons, as voiced by Penfold! Love this episode. When we’re presented with fjords in Norway, I thought simultaneously about Asgard and the dead parrot Monty Python sketch. Facepalm moment when Whovians reminds me of the other place in Norway with a portal to an alternative universe. 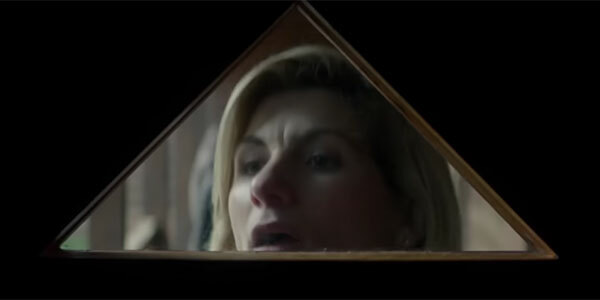 The whole Bad Wolf thing didn’t grip me as much as it did others, though I could not help but think of Doctor/Rose and the dual universes with this one. Had a good chuckle at the return of `reverse the polarity’. Oh, Graham! I seriously thought he would decide to stay in the Solitract. Then we get the moment when he rejects `Not Grace’, which I felt was Graham getting to the Acceptance stage of grief. Then Ryan goes and calls him Grandad. There was something in my eyes and a weird bawling noise emanating from my throat. My dinner consisted of a variation on the cheese and pickle sandwich.